Don Hunt, the last of the Toronto Sun's three co-founders, died yesterday in Toronto from leukaemia. He was 85. A Celebration of Life will be held Monday, Nov. 24 from 5 p.m. to 8 p.m. at St. George’s Golf and Country Club, 1668 Islington Avenue in Etobicoke. The last time we remember Don and fellow co-founders Doug Creighton and Peter Worthington, standing shoulder to shoulder was during the Toronto Sun's memorable 20th anniversary shindig at SkyDome, complete with a midway and fireworks. That thank you party - and earlier parties and gestures - said it all for their respect for employees who made the tabloid a huge success in the first two decades. A year later, the party ended with Doug's ouster from the board. Don left the Toronto Sun in 1988 to work at the Houston Post after it was purchased by the Sun and then the Denver Post, but returned to Toronto in 1991 for the 20th anniversary party. There were a few sets of brothers working at the Sun in the early years, including Don and his brother, Jim, a celebrated sports writer. Their smiles and laughter were contagious. So, at 30 the last of three men who led the charge at 222 King Street West, in a factory setting, and 333 King Street West, in a new building four years later. Don Hunt, founding general manager. Doug Creighton, founding publisher, died from Parkinson's disease at 75 on Jan. 7, 2004. We are forever indebted to Doug, Peter and Don. TORONTO - He was a gentle giant of a guy — a newspaper legend who had printer’s ink in his veins and a brilliant business mind that guided the Toronto Sun through its financially perilous early years. Don Hunt, the paper’s first general manager, died Tuesday at Toronto General Hospital of leukaemia. While former colleagues at the Sun remembered him for his business smarts, his daughter, Patricia, is mourning him as a loving father, grandfather and great-grandfather. At 6-foot-6, he was a big guy with a big heart, who liked nothing more than to take his grandkids to the beach. Hunt was one of the triumvirate that founded the Sun. 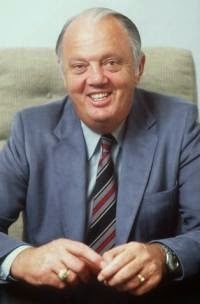 The late Doug Creighton was the publisher. Peter Worthington, who died last year, was the editor. Hunt was the third leg in the stool, so to speak, the calm business voice who kept a steady control over the paper’s finances, while Creighton and Worthington focused on the editorial side of the business. An avid sports enthusiast, Hunt always insisted sports be given prominence in the Sun. “He loved the Detroit Tigers and loved to go to games at Tiger Stadium,” Patricia recalled. He leaves his wife of 59 years, Helen, as well as five children, Patricia, Cameron, Andrea Fennessey, Ian and Paula. He also had 10 grandchildren and two great-grandchildren. “He loved to go to Florida and play on the beach with them,” she said. Hunt grew up in Sarnia and was in the fourth graduating year of the University of Western Ontario’s journalism program. He had two brothers, Jack and Jim “Shakey” Hunt, also a sports writer. He started working for the Montreal Star when he was 17 and later moved to Toronto, where he joined the now-defunct Toronto Telegram. When the Tely folded, he moved to the Sun. His storied journalism career included meetings with Fidel Castro and Che Guevera when he covered the winter league baseball in Cuba. He’d met many U.S. presidents, including Jimmy Carter, Gerald Ford and George H.W. Bush. He had drinks in the White House with Ronald Reagan. “He was a great father and he was always the life of the party,” Patricia recalled. Hunt loved to play golf and baseball, and in his teens played basketball against the Harlem Globetrotters. He was also instrumental in starting Can-Am Racing, a predecessor of what is now the Honda Indy and he promoted F1 racing at Mosport. Hunt quit the Sun in 1988 to go to the Houston Post. He later moved to the Denver Post. Glen Woodcock, who was the Sun’s first production manager, recalled the fledgling Sun could not have survived without Hunt’s firm hand on the tiller. “Without Don, we wouldn’t have had any success,” said Woodcock, who now writes an auto column for the Sun. He remembered a guy who would always watching the dollars. “He was the guy who kept us on the straight and narrow when it came to spending money in the early days,” Woodcock said. Hunt had ran the Tely’s syndicate department, and brought the rights to many features to the Sun. Woodcock remembers he always wanted to run the Peanuts cartoon in the Sun — but Hunt balked. While he was careful with cash, Hunt would loosen the purse strings if he saw a good idea. Woodcock pitched the idea of running a Day in the Life of Toronto - and asked for an unheard-of 28 clear pages to run photographs from all the Sun photographers. When Woodcock explained, Hunt didn’t hesitate: “You’ve got them,” he said. He also remembers Hunt okaying putting a pop machine in the darkroom - except instead of ginger ale, it was stocked with beer. “It lasted for a week until there was a drunken brawl between the circulation department and the composing room,” Woodcock recalled. Cartoonist Andy Donato remembers Hunt as the quiet guy who was always working in his corner office and who stayed away from office politics. “Peter and Doug were the ones out front. He was never the kind of guy who wanted the limelight,” Donato recalled. After Hunt moved to the Houston Post, he wanted to stay on the board of the Toronto Sun. When the Sun balked, he sold his stock and stayed in the U.S.
“He was the steady guy in the middle who kept Doug and Peter apart - the voice of sanity,” Donato said. Sun Media’s v-p of editorial, Glenn Garnett, recalled that Hunt was a good sport who at one legendary event dressed up as General George Patton for an advertising department motivational party. Garnett, who edited the Sun’s official history, The Little Paper That Grew, by Jean Sonmor, said there was a great deal of tension between Hunt and Creighton in Hunt’s latter years with the company. The last time the three Sun founders got together was at a lavish party at SkyDome, now Rogers Centre. In 1991, Creighton had laid out a massive celebration, complete with a merry-go-round. The last picture of them together, they’re on that merry-go-round. In his book, Looking For Trouble, Worthington remembered Hunt as the guy affectionately dubbed “Dr. No.” He was the guy who told everyone we couldn’t afford big expenses and had to live within our means. “For all his blunt, sometimes insensitive exterior, Hunt was kind, scrupulously honest and competent,” Worthington wrote in his book. Long-time Sun editor John Downing recalled that Hunt lived near him in Etobicoke and one of the paper’s first carriers in that area was one of Hunt’s sons. Downing’s son took over when he quit. Downing said Hunt rarely got into political discussions, but would simply sit on the side as Worthington and Creighton quibbled about which politicians they’d support. He recalled Hunt as a calm presence in a business where tempers could often flare. He also remembered him as the guy who was very much his own man - and wouldn’t listen to what others were telling him. “When the Tely folded, Don sued (Tely owner) John Bassett - and won,” Downing recalled. Downing had been advised not to sue — and regrets not having collected money he was owed. A Celebration of Hunt’s life will take place 5 p.m. to 8 p.m. Monday, Nov. 24, at St. George’s Golf and Country Club, 1668 Islington Avenue in Etobicoke.